As a patient of a Kois-trained dentist, recommendations made to improve your dental health often use evidence-based dentistry. The word evidence may bring to mind a courtroom, where materials are gathered and manipulated to prove or disprove a point. Evidencebased dentistry is different; quite simply it is dentistry firmly rooted in proof and confirmation. When dentists base their practice on evidence, they are using the latest reliable research to make decisions and recommendations for you, their patient. They use their knowledge and experience to properly apply the available evidence and may adapt their treatment recommendations based on trustworthy and responsible research. For example, when evaluating a tooth with a large filling, your dentist knows from published studies how much weaker it is based on the size and width of the filling coupled with the strength of your bite. The evidence gives your dentist reliable information about which teeth in your mouth are more likely to break and why. Your dentist can apply the evidence to make recommendations on how best to protect vulnerable teeth. A dentist whose practice is evidence-based uses research and will make different recommendations based on you, the patient, and your susceptibility. In order to make appropriate decisions for your teeth, your dentist must know how to evaluate published evidence and determine which study is applicable to your situation while staying current on new information. 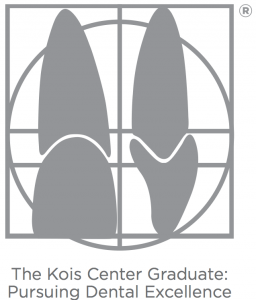 All protocols for treatment that dentists learn at the Kois Center are grounded in published science, and Kois Center graduates are proficient in understanding the dental literature. Course content is continuously updated to teach only the most recent science.